Moving is hard for just about anyone. Moving with small children is even harder- their entire life is in upheaval. Here are a few things that made the transition easier for us and our girls. 1.) Spend time where you're going, before you move. This isn't always possible if you're moving many hours away. Fortunately for us we moved about an hour away, close to family. During the process of selling we made a point to frequent our new area. Even before we'd found a house, Adventure Days exploring our new area became a real treat. We've been in our new house for almost a month and C regularly requests to "go on a Venture today." Moving can send their entire world into upheaval. Shifting some of their world gradually can make the leap and landing quite a bit softer. In the reverse, we slowly stopped going to some places near our old house well before we moved. It's tempting to take advantage of the wonderful things you'll miss once you move. However for our girls, it was best to shift their familiarity to our new town and places. 2.) Talk about what you're looking forward to about your new home. As adults we have a fair amount of practice dealing with uncertain situations. It may drive us a bit nuts, but we know that after we move our life will settle in and feel normal again. Focusing on the great new things, and the wonderful things that will be the same reassured them greatly. 3.) Get an extra laundry basket for loose stuff as you dash out the door. This one is a bit more practical, but was a lifesaver every time we had to be out of the house. We bought an extra laundry basket. Any time we had to leave the house "show-ready" I grabbed the detritus and we were off. Getting the girls out the door in time was sometimes almost all I could handle. Being able to just grab the odds and ends and pop them in the trunk of my car was so handy. When we returned to the house, the basket came right back in and we could start right where we left off. This book was part of our daily reading for the better part of two months before we moved. We talked about friends, particularly with children, who'd moved recently. We shared our own experiences and told stories about moving. Talking about others (real or fictional) going through similar experiences makes the whole ordeal more like a part of normal life. Instead of feeling cut off from what they knew, we all feel more connected. C was worried about what things we were bringing. We had many many conversations about if we were bringing such and such with us. As I packed my own things I often found a beloved item of hers at the top of the box. While she was very worried about the move, she was an enthusiastic helper. She cleaned, polished, swept, vacuumed, painted, and decorated countless boxes. Children do so need to be important, be valuable, and have just as strong of a desire to be useful as we do. 6.) Be prepared to change course. I had a wonderful goodbye planned. From everything I'd read, saying goodbye was a vital part of the moving process. I wanted to take C through each empty room and say goodbye and thank you to our old home, and then a final tour of our property. This is what I've done with almost every house I've left, and is part of my own moving process. In the end, I loaded two exhausted and tender girls into their car seats. I did my own mental goodbye tour as they slept on our drive only minutes later. While it wasn't the graceful exit I'd rehearsed in my head, it was what the girls needed. More than dwelling on leaving what they knew, I tipped my hat in salute, and drove off into our new life. what a great article Myrrh. I love it! Thank you so much for your support, your comment, and taking the time to read what I write! Sending love and happy Thanksgiving! I really like when you post updates! 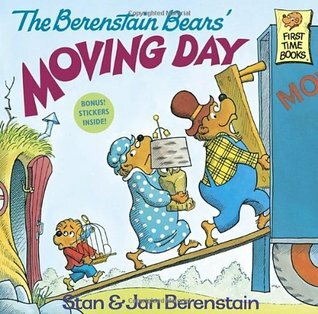 Berenstain Bears books are a favorite around here, too. They seem to have one for just about any situation. Hopefully it will work out for us to get together sometime soon!